The River Ure rises in the hills above Hawes in Wensleydale and flows 45 miles to its confluence with the River Swale at Boroughbridge. The River Ure is unique among the main Yorkshire Dales rivers in that it does not share its name with the dale that it flows through e.g. the River Wharfe in Wharfedale and the River Nidd in Nidderdale, etc. The River Ure flows through Wensleydale and provides us with some fine fly fishing. I used to consider the River Ure the best grayling river in Yorkshire, maybe the whole of England, but it must be said that over recent years the quality of fly fishing on the River Ure has declined somewhat due to a collapse of the grayling population, particularly in what I class as the 'Middle Ure', roughly Leyburn to Ripon. Brown trout stocks appear unaffected and there is still good fly fishing for trout on the River Ure, particularly in the upper river. Many reasons have been put forward for this decline and I don't think there is a single cause, rather, a combination of factors. Don't let this put you off, the River Ure still holds good stocks of brown trout and grayling, probably as good as other Yorkshire Dales rivers, but it is the huge stocks of grayling that the Ure was once famous for that have collapsed. The River Ure once held shoals of grayling to equal any river I have ever fished (possibly with the exception of the River San in Poland and, Kupa and Curak rivers in Croatia). Fly fishing for trout and grayling on the River Ure is good from the source of the river above Hawes downstream to Aysgarth Falls. Below these famous waterfalls the river is mostly private, belonging to clubs or syndicates with no general access. However, it is this section of river that has suffered the most from the decline of grayling, so this area of the river is now generally stocked with farm reared trout to sustain it as a viable fishery. Not being a fan of artificial stocking I now mostly fish the 'wild', upper river, around Aysgarth, Bainbridge and Hawes, which is one of my favourite areas in the Yorkshire Dales to fish. It is not a numbers river hereabouts, but it makes up for this with wild fish of a good average size, stunning scenery and relatively un-fished pools. I offer guided fly fishing on the River Ure and also provide fly fishing tuition on much of the Upper River Ure and some unstocked areas downstream. The River Ure is a medium sized river with good hatches of fly right through the season, but with particularly good hatches of large dark olive, yellow may dun, pale wateries, stoneflies and sedges. Fly fishing on the River Ure, 'matching the hatch', can be particularly rewarding, though not always easy! 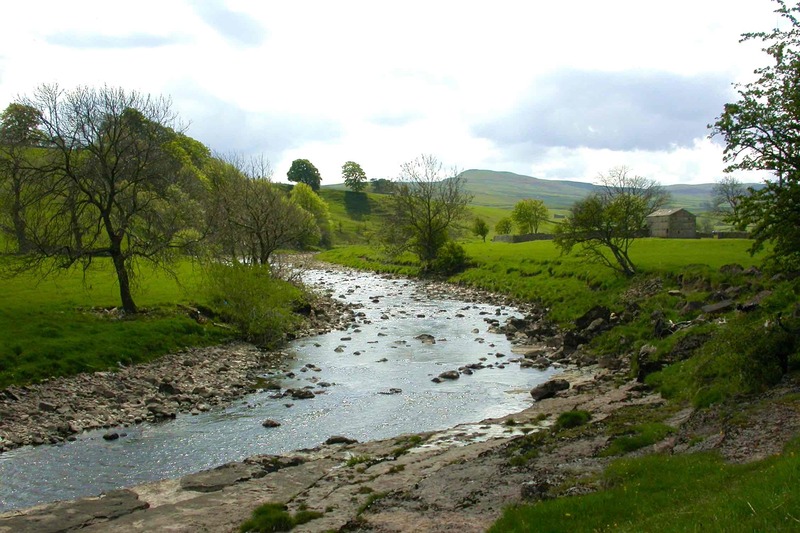 The River Ure has two tributaries well worth fly fishing in Upper Wensleydale; the River Cover and the River Bain. Both these small rivers offer good fly fishing for wild brown trout. I have read that there are grayling in the Bain and Cover. I have caught very large grayling from the River Cover, but never caught or heard of any being caught from the River Bain. Chances are that you won't see another angler all day on these rivers. As I have said above the Upper River Ure is a gem of a river but it does need local knowledge to get the best from it. I can guide you on many of the very best stretches of the river that are well placed to provide good fly fishing in the right conditions. A careful approach and rivercraft are needed on the 'smaller' Upper Ure, tactics where a fly fishing guide certainly comes in and earns his money. Some of my earliest exploits with a fly rod were in these parts of the Yorkshire Dales and I know what is required to catch the sometimes difficult trout and grayling here. Wensleydale is probably my favourite of the Yorkshire Dales. It does not quite equal the breathtaking beauty of Wharfedale or the contrasting landscapes of Nidderdale, but it does have that certain something that you can't put your finger on. It is quieter than some of the other Yorkshire Dales; the fact that it is further away from the bigger towns and cities of industrial West Yorkshire must be a contributing factor in this. It does, though, have all the characteristics of the other Dales... dry stone walls, steep valley sides, evidence of the underlying limestone rock protruding through the fields and hills, sheep, meadows, disused stone barns...etc. Day ticket anglers are well catered for on the Upper River Ure with a few clubs offering reasonably priced day tickets.